What is a small business…? Well, you thought you knew, but the SBA would like to change all that (it’s a proposal…not for certain). Now, before you get your hackles up…I believe what they are doing is a good thing. They are basically getting with the times. A proposed rule published today for comment in The Federal Register by the U.S. Small Business Administration would adjust the size definition of small businesses in the transportation and warehousing sector to reflect changes in marketplace conditions in those sectors. 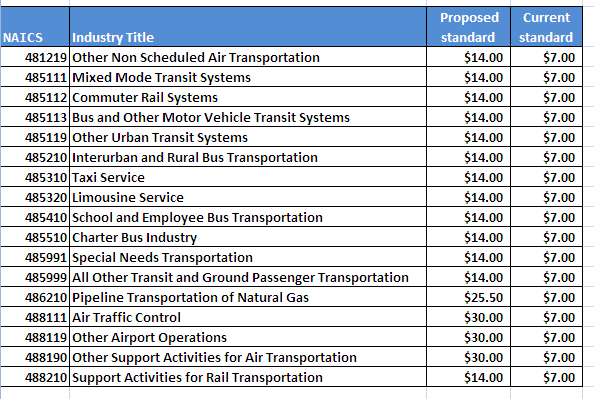 The proposed revisions would increase the revenue-based size definition businesses must meet to qualify as small businesses in 22 industries of the transportation and warehousing sector. As part of its ongoing comprehensive review of all size standards, the SBA evaluated all industries in this sector that have revenue-based size standards to determine whether the size standards should be retained or revised. So what does this mean for you? Well if you work in the transportation and warehousing sector and you are bidding on government jobs…a lot! Basically, in the past, if you were reaching the size limit…you couldn’t make any more in revenue to retain your eligibility to bid on government jobs (as a small business). Now, you have a bit more wiggle room! The changes would allow some small businesses that are close to exceeding their current size standards to retain small business eligibility under higher size standards, give federal agencies a larger selection of small businesses to choose from for small business procurement opportunities and allow small businesses to qualify for financial assistance from the SBA. SBA estimates as many as 1,200 additional firms will become eligible for SBA programs as a result of the proposed revisions, if they are adopted. Here’s the new data that I prettied up for you! For more information about SBA’s revisions to its small business size standards, click on “What’s New” on SBA’s Web site at: http://www.sba.gov/size. Are you breathing a sigh of relief on this proposed change? I am! Building and running a successful business is difficult period. Add in a weak economy and woe is the business owner, small businesses in particular. That said, I am happy to see that even though times have been tough, small businesses are keeping a stiff upper lip. According to a new survey conducted by EMPLOYERS®, America’s small business insurance specialist® (through ORC/Inforgraphics), almost half of small business decision-makers (46%) feel that the U.S. Economic Outlook will be better this year than last— a significant improvement compared to 25% measured when they did the study in Dec. 2008. And, 41% of small business decision-makers expect their revenue to grow this year over 2010 levels. 69% of small business decision-makers say that some worry about their business keeps them up at night. The most often reported worries were: the economy, figuring out how they can grow/maintain their business, operating expenses and rising fuel prices.51% of small business decision-makers believe it will be more than 12 months before their sales revenues return to pre-recession levels. 49% of small business decision-makers say it will be more than six months before they begin hiring again. Here’s how they did the study: The study commissioned by EMPLOYERS surveyed 501 owners or managers of small businesses with 1-99 full-time employees. Data was collected through telephone interviews during the period February 23 – March 1, 2011 at the 95 percent confidence level. The survey was conducted by ORC International, an Infogroup company through their Small Business CARAVAN. That’s how the average small business owner is feeling…what about you? Are you bullish or bearish about the U.S. Economic Outlook in 2011?